Procter & Gamble‘s stock price has fluctuated between $71 and $92 since the beginning of 2018, due to falling prices and rising cost inflation. In its recent earnings, the company’s net sales came in flat at $16.7 billion, driven by growth in the Beauty and Fabric Care segments, offset by declines in the Grooming, Health Care, and Baby and Feminine Care businesses. Furthermore, foreign currency exchange headwinds also impacted the company’s results by 3%. However, P&G’s organic sales were up 4% year-over-year (y-o-y) on 3% volume growth, with flat pricing and 1% growth in mix across segments, excluding the impacts of foreign exchange, acquisitions, and divestitures. In terms of bottom line, P&G’s core EPS (adjusted) also grew 3% y-o-y to $1.12, primarily driven by increased net sales, partially offset by cost challenges. We have summarized our forecasts in our interactive dashboard on P&G’s Fundamental Value. You can modify assumptions such as changes in expected segment revenue or EBITDA margins to see how they impact the company’s value. 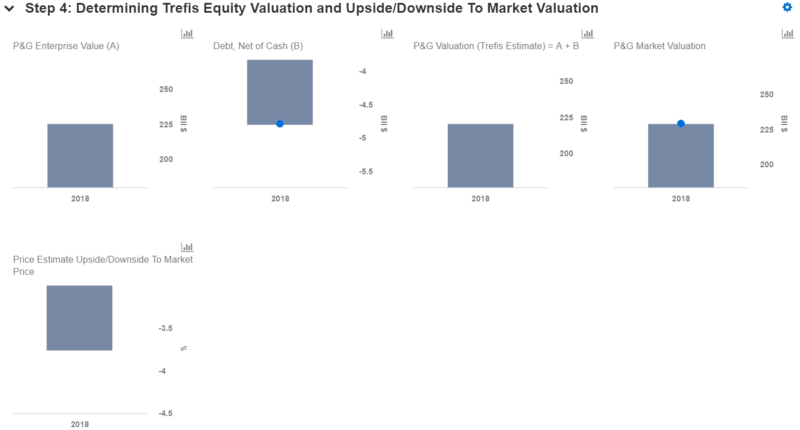 The charts below show some of the key steps in identifying P&G’s valuation sensitivity to changes in its segment revenues. We detail how changes in revenue or segment EBITDA margin impacts total EBITDA, which in turn impacts its enterprise value (assuming a constant EBITDA multiple). We have maintained our long-term price estimate for P&G at $84, which is slightly ahead of the current market price. 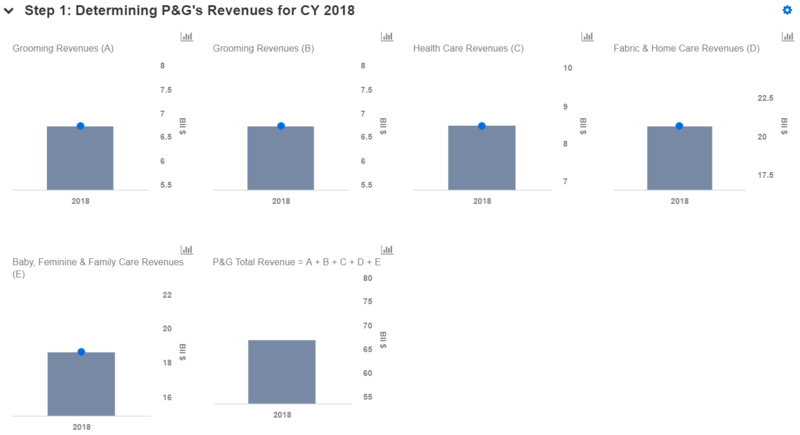 Overall, we expect P&G to generate around $66.9 billion (+2% y-o-y) in revenues in calendar year 2018, and adjusted earnings of almost $11.5 billion. Of the total expected revenues in 2018, we estimate $12.4 billion in the Beauty business, around $6.7 billion for the Grooming business, nearly $8.5 billion for the Health Care segment, almost $20.7 billion in the Fabric & Home Care business, and nearly $18.6 billion in the Baby, Feminine & Family Care segment. In the quarter ending December, we expect Procter & Gamble to report a slight decline in revenues on the back of declines across major segments – Grooming, Health Care and Baby, Feminine, and Family Care. This is because we expect the rising competition from local players to negatively impact the revenue in the Baby, Feminine, and Family Care segments in the same quarter. We also expect the Grooming segment to continue its declining revenue trend, due to competitive pressure from the likes of Dollar Shave Club. However, the rising popularity of its direct-to-customer model Gillette-On-Demand could offset some of this pressure. In addition, commodity costs, foreign exchange challenges, and transportation costs could persist and potentially worsen, which could impact the company’s growth rates. Almost 56% of P&G’s revenue comes from outside of North America, of which a major chunk (34%) comes from emerging markets. P&G’s revenues in these markets are largely influenced by local cultural buying habits and local currency exchange rates, in addition to local competition and political issues. Of late, currency fluctuations have remained a major headwind for the company – with the Turkish lira devaluing more than 25%, the Argentine peso more than 10%, and the Indian rupee nearly 15%. Going forward, the company’s revenues could fall if the market volatility continues into the upcoming quarter as well. Further, it should also be noted that trucking costs are expected to be up 25% or more compared to last year’s levels. In order to combat these headwinds, the company is planning to increase some selective prices in the Home Care, Oral Care, and Personal Care segments. Our forecasts for the year are summarized in our dashboard for Procter & Gamble. 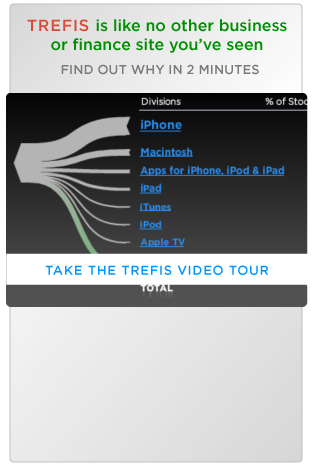 If you have a different view, you can modify various inputs to see how updated inputs impact the company’s valuation. You can also share the links to scenarios created on our platform.